We know and love kangaroos as graceful hoppers. But not all of the charismatic marsupials were able to bound across Australia's grasslands. During the last Ice Age, over 30,000 years ago, there were immense, rabbit-faced kangaroos that were so big that they had to take it one step at a time. Known as sthenurine kangaroos to paleontologists, these fossil mammals aren't new to science. The British anatomist Richard Owen named two of the giants - Sthenurus and Procoptodon - in 1873. But ever since their discovery, scientists have been perplexed by the peculiar anatomy of the long-lost marsupials. 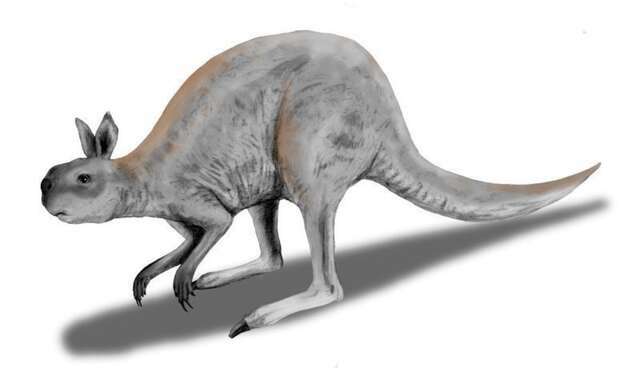 For one thing, the giant ‘roos had strange feet. Each foot was really a big, single toe that ended in a hoof-like claw. They also had stockier skeletons for their size, with shorter tails than is typical for kangaroos. And in addition to rounded, rabbit-like faces, kangaroos like Sthenurus had evolved specialized arms and shoulders that allowed them to reach above their heads to pull down succulent leaves. In lifestyle, at least, they were less like modern kangaroos and more like marsupial equivalent of giant ground sloths. All of these odd features led paleontologists to doubt whether these kangaroos hopped much, if at all. It's difficult to image a kangaroo like Procoptodon, estimated to weigh about 530 pounds, bouncing along the primeval outback. Indeed, now Brown University paleontologist Christine Janis and colleagues have published a new analysis that proposes Sthenurus and kin were incapable of getting around like today's red and gray kangaroos. Based on their size and ancestry, the giants evolved a strange strut. 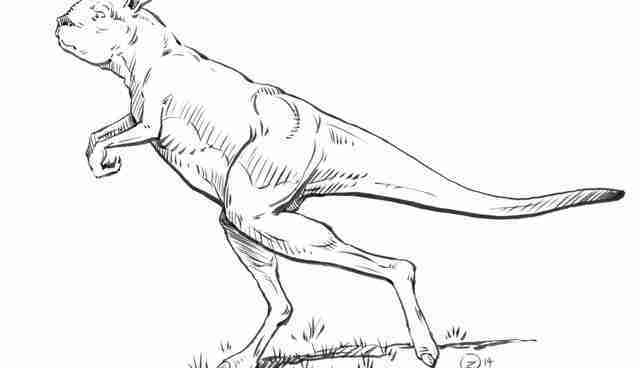 Through a reexamination of fossil kangaroo skeletal anatomy and statistical analysis that compared their bones to living kangaroos, the researchers suggest that the extinct giants were more likely to strut than to hop. The red kangaroo is the largest species alive today, with males weighing an average of 121 pounds and females about 55 pounds. And they have two main modes of getting around. While moving fast, they hop, their tails bouncing along as their extraordinarily elastic tendons help propel them along. This is a very energy-efficient way to move quickly, but just doesn't work at slow speed which is when these kangaroos switch to a "pentapedal walk." Using their arms to brace themselves, the kangaroos lift their hind legs and push off with their tails. Procoptodon and its relatives couldn't do either. With increasing size, Janis and coauthors point out, there's an ever greater risk of tendon rupture while hopping. Not to mention that the extinct kangaroos, driven to extinction by climate change or hungry humans, had rigid backs that would have hindered their ability to bounce. Nor could the giants do the five-point walk. Their palms couldn't properly rotate to brace the ground, and their shorter tails lacked some of the strong musculature needed to do the big push-off. But there is another option. Living tree kangaroos, the researchers note, sometimes walk upright along branches, and the giant, extinct kangaroos could have moved in a similar way, waddling back and forth as they held their torsos upright and shifted between one foot and the next. They likely inherited this way of walking from their smaller ancestors. Predecessors of Sthenurus were diminutive enough for hopping to be an option, but their forelimbs were already adapted to grasping branches and made it unlikely that they could use the pentadal walk. At slow speed, Janis and colleagues suggest, they may have moved with a tottering walk. And as their descendants became bigger and bigger, this strange strut became the main way of walking for the heftier Ice Age kangaroos. Unfortunately, these giant kangaroos didn't leave any modern-day relatives to study. Janis and colleagues hope that fossil kangaroos tracks - imprints that trace prehistoric behavior - will help test their idea. For now, we're left with their bones and the ability of our imaginations to envision the long-lost sloth-roos.